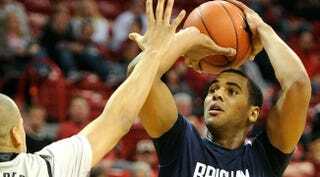 When BYU basketball star Brandon Davies was suspended early this week for honor code violations, it wasn't immediately clear what the transgression was. After all, the Mormon university's honor code also includes regulating dress and grooming and abstaining from alcohol — was that enough? The New York Times points out, "The rules would hardly be a surprise to Davies. He is Mormon and was raised in Provo, Utah, the home of B.Y.U." The suspension has been extremely costly to Davies and his team: per Washington Post columnist Tracee Hamilton, "The Cougars were ranked No. 3 in the country and in the running for a No. 1 seed in the NCAA tournament. Without Davies, they lost at home Wednesday night to unranked New Mexico, and the dream of a top seed is over." As absurd and antiquated as it seems to penalize Davies this way when star athletes so often get a pass for say, being rapists, there is a strange equality to all this. There is a long history of girls, thankfully behind us in the U.S., who get pregnant being punished for their "crimes" while the male half of the conception goes on with his life. At least BYU's code, into which Davies entered willingly, was equal-opportunity.